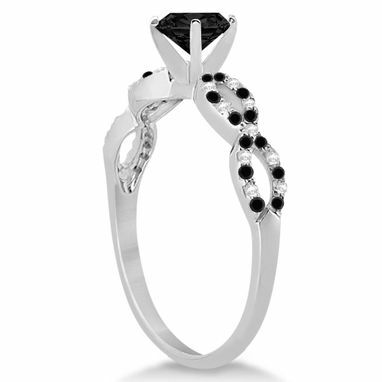 The luxury of stunning black diamonds and the sparkle of near colorless white diamonds twist artistically to create a preset infinity engagement ring sure to dazzle. 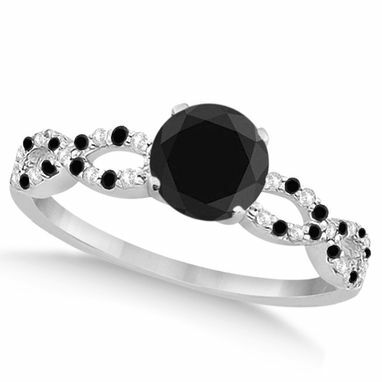 This black and white diamond engagement ring features a stunning fancy diamond center stone flanked on either side by approximately 24 black and 18 white conflict free diamonds set into a lovely 14k white gold infinity design. Present her with the engagement ring she's sure to adore with an approximately carat weight of 0.71.